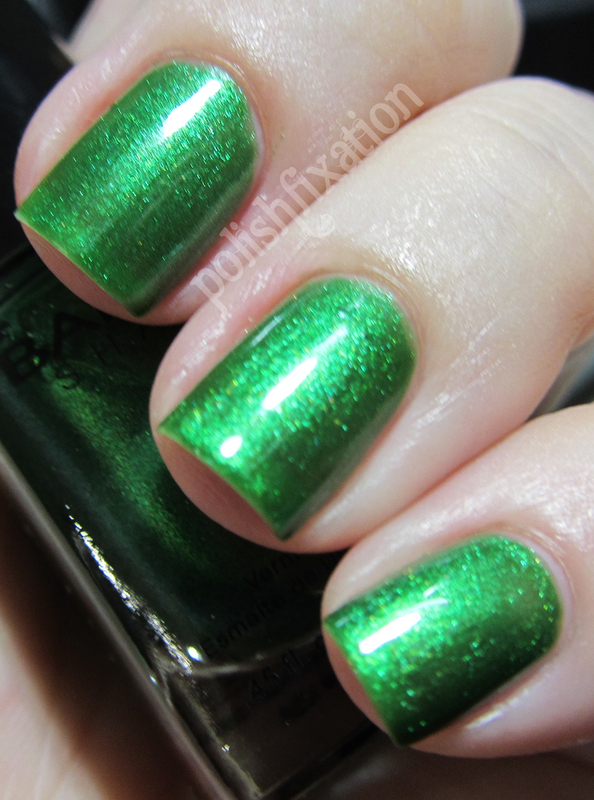 polish fixation: Barielle: Some Like it Hot 5-pack! Barielle: Some Like it Hot 5-pack! Today I have some swatches for you of the colors you can find in the Barielle 5-pack "Some Like it Hot". Lily of the Valley is a shimmer/metallic bright grass green color. The formula was a little bit sheer on the first coat but I only needed 2 coats for the above picture. Gotta Have Fate has been a favorite Barielle shade of mine since it was released last year. It's a gorgeous deep coral with a super opaque and easy to work with formula. I used 2 coats for the above picture, though a thicker application can definitely get away with just one. Life of the Party is a fun bright pink creme polish. The formula was great and it's another very opaque shade. I used two coats, but it could easily be worn with one. Sunshine is a gorgeous yellow creme that has just a hint of shimmer to it. I love this polish! It wasn't streaky or awkward to apply, as some yellows can be. I also only needed 2 coats for the opacity shown. It is super bright and summery! Surf's Up is a vivid blue creme polish that is extremely opaque. I fell in love with this color the moment the brush hit my nail for the first time. I loved this polish right up until it came time to take it off...my nails were smurftastically blue! They loved the color so much they wanted to keep it longer than I did! So a word of advice: Double up your base coat when you wear this polish! It's too gorgeous to not wear! A side note: The staining came off immediately with my usual tactic of using Roux: Clean Touch which is actually meant for removing hair dye stains from your skin, but I have found it works wonders for polish-stained nails as well. Don't let staining keep you away from pretty polishes! All in all I am really loving these Barielle Shades from the Some Like it Hot 5-pack. The 5-packs can be purchased from Barielle's Website, and retail at $25 a pack, which is a $7 savings from buying 5 individual polishes! A really nice deal! What do you think of these colors? I love Gotta Have Fate! I even put it in my 2011 faves post! These are lovely!! I am really digging Lilly of the Valley, gotta love a great shimmery green!